Provide comfort for the family of Gladys Moore with a meaningful gesture of sympathy. Gladys Helen Blount was born to Robert and Cora Blount on a farm near the small town of Shirley, Missouri on December 4, 1919 in a place called “Grassy Hollow.” She and five of her siblings walked about a mile into the woods to a one room school house. 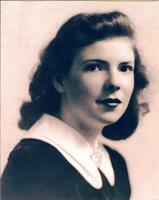 She loved school and excelled in math and reading. Gladys loved gathering wildflowers around the farm and riding her horse she named, “Fanny.” Horses were a vital part of life on the farm. The Blount family had several, some were for working the fields and others were for transportation. Life was very different on many of the farms during that time with no electricity or running water inside the homes. In the evenings, the Blount’s would listen to old records on the Victrola, read books and played games. Each year, the Christmas tree was decorated with cotton balls, strings of popcorn, real candles for lighting and, of course, homemade ornaments. After marrying Daniel E. Moore, Gladys settled in St. Louis, Missouri where they raised three sons: John, Donald and Robert. She was a homemaker who enjoyed decorating the house and had works of fine art throughout most of the rooms. Gladys socialized quite often and enjoyed dancing, a lot. She also loved listening to classical music and operas. Her husband, Daniel, played a classical violin and she sang in high soprano. The two of them would pair together and play duets. In her later years, she participated in the many activities and events at her new home at Hilltop Manor Senior Living Apartments in Eureka, Missouri. Her son would often take her on adventures to the St. Louis Art Museum, St. Louis Zoo and Missouri Botanical Gardens. Gladys was a vivid reader, focusing on non-fiction subjects, and was always eager to learn something new. While keeping her Christian faith, she showed a keen interest in Buddhist Philosophy. She had an innate capacity for compassion towards the natural world and humanity. Most recently, Gladys was happy living at her new home in Arcadia Valley, Missouri since early spring 2018. She enjoyed going for rides on the old country roads and sitting out on her porch in the evenings, feeding the cats treats. The most important part of her life on this earthly plane was her family as it is now on the eternal plane. Gladys passed away on February 18, 2019 at Missouri Baptist Medical Center having reached ninety-nine years of age. In addition to her parents, Gladys is preceded in death by her beloved husband, Daniel E. Moore; and siblings: Bryan, Lottie, Kenneth, Carley, Paul, Mary, Verner, Larry, and Robert. Gladys is survived by her three sons: Donald Moore, Bob Moore, and John Moore; three grandchildren: Sarah, Daniel, and Becky; and six great-grandchildren. Visitation for Gladys will be held on Sunday, March 10, 2019 at DeClue Funeral Home, beginning at 12:00 p.m. Funeral services will begin at 2:00 p.m. with Elder Leonard Compton officiating. Interment and final prayers will be held at Blount Cemetery in Shirley, Missouri. All funeral arrangements have been cared for by DeClue Funeral Home. To send flowers in memory of Gladys Helen Moore, please visit our Heartfelt Sympathies Store. We encourage you to share your most beloved memories of Gladys here, so that the family and other loved ones can always see it. You can upload cherished photographs, or share your favorite stories, and can even comment on those shared by others. Provide comfort for the family of Gladys Helen Moore by sending flowers. My sincerest condolences. She was a truly lovely woman and lady. She always shared an appreciation for beautiful things with those around her and I am better for having known her.